1. I first met Adrian Van Young at 2012 AWP, when he was hanging out at the Gigantic table. I remembered him as an engaging person to talk to. That’s saying a lot, cuz, you know, AWP. 2. Six months later he emailed me about reading in Baltimore. That’s when I remembered what a nice guy he was. 3. His email was cordial but also professional, and he attached a press release about his book, The Man Who Noticed Everything, and a headshot. The color scheme in the photo matched the colors on his book jacket: black and dark green. 4. Ben Marcus said “you’d think this book was an anthology collecting the work of the best young writers of the new generation”—talking about The Man Who Noticed Everything. 5. So we set up a reading for January, even though I hadn’t read his book and even though the main provision for the series that Stephanie Barber and I run is that we’ll only host writers whose work we really admire. I guess the thinking was, this guy has his act together. 6. And he does. I’m not just saying that because he brought a fresh bottle of Jameson to the reading. 7. At the reading, Adrian read a short story. Sometimes I have a hard time listening to fiction. It can be so boring. 8. But while Adrian read, I laughed and laughed. The story was called “The Sub-Leaser,” and listening to it, I felt like it was full of jokes. Or, actually, it struck me as a better kind of funny writing, in which there aren’t actually jokes, but the whole concept (and the way the concept is delivered) is meant to be funny. 10. “ill-sequenced of tile”? “an insolent toilet”? You see what I mean. The whole story is like that. 11. He is like Edgar Allan Poe. 12. “The Sub-Leaser” is about a guy who rents out a room in his apartment. When the sub-leaser leaves, the guy goes a little crazy, finds his life turned upside down, can’t figure out what’s going on. Whereas a Poe story would probably have killed a character and buried him behind a wall, the only thing that happens in the Van Young version is that the sub-leaser considerately calls a cleaning service to take care of his room, but the guy declines the favor. He’s a head case, to be sure. 13. 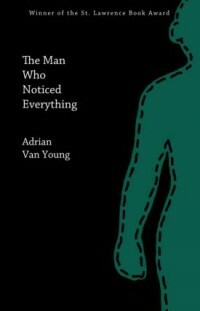 An Adrian Van Young story is about voice. The stories in this book, you read them slowly. They have a slowing effect. 14. There are eight stories total. They are each skillful. The reason I said it’s precarious to write the way he does is that it’s so easy to lose the tone and then you’re just left with a pile of quirky sentences. To do it right requires consistency, and Adrian does it right. 15. In “The Sub-Leaser” there is a real phone number. At the reading, I asked Adrian whose number it was, and he didn’t know, so I called it. There was no answer. 16. Remember when I was talking about the book cover being dark green, just like his headshot? Well, if you want to read this book and want something peculiar to pay attention to while doing so, keep an eye out for how often the color green comes up. 17. The first story is called “Hard Water.” It put me in mind of William Gass. It’s kind of a cowboy thing, but has gays in it. 18. Another story I really liked is called “The Elder Brother Washes His Hands.” It’s a civil war story, but it seemed a little like Shakespeare because there are three, like, spectres or whatever. 19. The title story, “The Man Who Noticed Everything,” is about a guy who takes a day laboring job digging up dead bodies from a graveyard. It’s haunting and mysterious, but not because it’s about a guy digging up dead bodies from a graveyard. It’s because you don’t know who the guy is, where he came from and where he ends up (he ends up in what seems like a grave, but in the story’s last line he says he’s “happy to begin his life on such outstanding terms”). 20. Why does he care about the foreman’s son so much? What’s the deal with him and Carol, the waitress, who sleeps with him in his sleeping bag? 21. I didn’t see Adrian at AWP this year. My loss. 22. Lovecraft. That’s what I’m looking for. The stories in The Man Who Noticed Everything have the sensibility that the world is unknowable, human experience is mysterious even to the human experiencer. 23. The stories are subtle because big action, like life, is unrealistic. Maybe. I dunno. 24. Want to know more about the horror behind these stories? Read Adrian’s essay in The Believer about horror movies for background. It’s excellent. It should be published as the book’s appendix.